Playing black, Anand showed better preparation as Carlsen could not really take him to uncharted territory and the result was a draw in just 16 moves. After soaking in the pressure and being immersed in preparation for months, defending champion Viswanathan Anand today said he felt relieved that his World Championship match against Magnus Carlsen started on Saturday but his rival was not too pleased with first day's proceedings. "After thinking about it for months and months, today it finally started, it's almost a relief," said the 43-year-old Anand in his opening statement after the first game which ended in a quick draw. "I am not too thrilled with the game but of course I am happy to play, normally in these lines play develops quickly but here there was some crisis early and I had to pull the emergency breaks and take a draw," the Norwegian said in the post-match press conference. When asked about the hype the match has created across the globe, Anand was quite candid, "I am quite happy that it has been covered well but to be honest I am more focused on the match." Carlsen, who looked far more relaxed than the first conference on Thursday, agreed with the Indian but was quick to add, "I hope in the next few days we will give you more than one and a half hour." Speaking about today's game, Anand said he was satisfied with the draw. "You can't start reacting to every twist and turn, there will be many twist and turns, today went well for me, I was thinking of 'b5' but I didn't see anything," he said. "A comfortable draw with the black pieces is always very satisfactory but there are many more to come, game one is out of the way and now we think about the second and we will take it from there," Anand added. Carlsen, however, was a tad disappointed and admitted to not having too many options today. "After 10 moves I had no chances, so I decided to go for this variation which is a draw," he said. 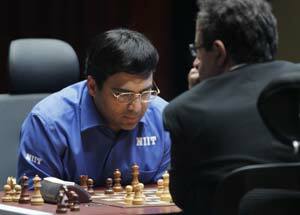 The world number one, however, agreed with Anand's views on the final position. "I did not mind that the game ended in a draw at that point and I don't think I would have minded if he had played on," said the Norwegian who is known as the Mozart of Chess. Reflecting upon his strength in the middle and endgames, Carlsen said this can happen against a strong opponent and "hopefully I will get some long games, it's a long match, no damage done, we will see." Carlsen was curt when asked if he was finally feeling at home in the city. "We are still in India, aren't we? We are settled now and obviously I don't feel any hostility," he said. Anand, on the other hand, could not hide his excitement at playing on home turf. "Presently I am in a bubble, It's great that it's held in my home town and last time I played near to home was in 1991 (the match against Alexey Dreev of Russia) this time it's even closer as far as driving distance is concerned, but I will reflect on these things later," Anand said.